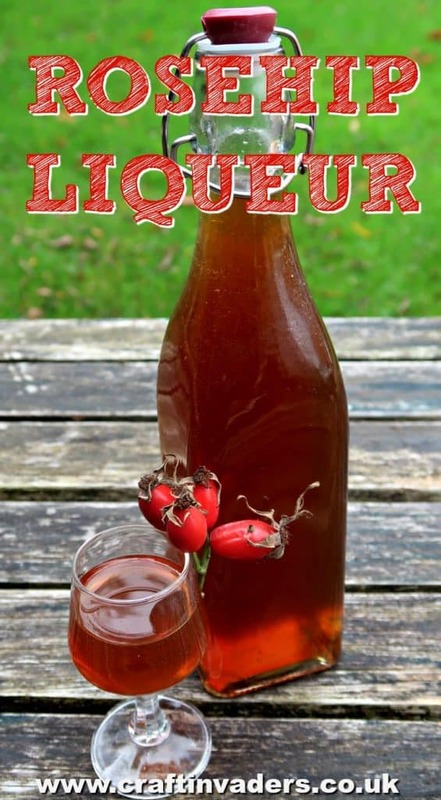 Out of all the hedgerow liqueurs, we have made this year; our Rosehip Liqueur is a favourite. In fact, it is currently hidden away to give it a chance to mature before hubby drinks it all! Rosehips are the beautiful red fruit of the rose (Rosa) bush. All roses and their fruit are edible, although flavour varies depending on the variety. We are fortunate in that we have lots of wild dog rose bushes growing in the hedgerows around our house and they have an excellent flavour. Rosehips have been used as food, medicine and in cosmetics for millennia. The ancient Greeks and Romans prized them highly for their health benefits. Packed full of vitamin C and Iron, syrup made from these fruits has a long history of being used here in the UK to prevent colds, particularly in children. I cant promise that our rosehip liqueur will stop you catching a cold, but since it tastes delicious, it’ll certainly cheer you up if you do have one. Rosehips are traditionally harvested after the first frosts, which is said to soften them and improve their flavour. Just as I do when making Sloe Gin, I like to store mine in the freezer before using. You can read all the advantages of doing so in our freezing foraged fruit post. 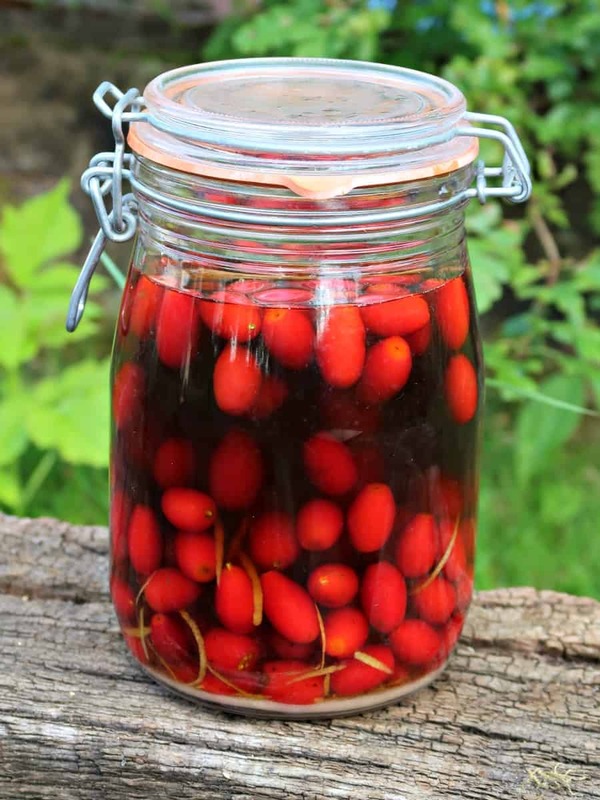 What you Need to Make Rosehip Liqueur. Just pop all your ingredients into a clean jar, and allow to sit for at least a month, shaking periodically. Then strain through muslin and bottle. This delicious, syrupy rosehip liqueur will continue to mature although it tastes fantastic from the start. It makes a lovely homemade gift, but I bet after you try it you won’t give a drop away! If we have wetted your appetite for delicious foraged concoctions we suggest you check out our Magical Himalayan Balsam Gin or our savoury Wild Horseradish and Ground Ivy Infused Vodka. Ooh I’m going to give this a go. We do Rosehip syrup but I’ve not heard of the liqueur before! Ohh great! It’s so yummy and delicous. Do u know if u can make this with dried rosehips? And if so, how much would you use? This sounds so interesting! We have a rose bush in our backyard that produces berries. I never would have thought about turning them into a liqueur. Thanks for sharing! Oh I can’t wait to try this Sarah. I have always heard that rosehips contain the highest concentration of vitamen C that our bodies can absorb and we have a pretty large bush that produces them. Strange, not all our roses bushes have rosehips. I must go research why that is. Anyways, I’d really love to try making this. Do let me know what you think if you do Michelle. I’d imagine your rose hips will be really sweet due to your climate. Maybe you dead-head your roses so don’t get the fruit? Yummy! That looks so pretty, but I bet it tastes even better! You’re so lucky to have that growing naturally all around you! This does sound delicious! Only I don’t like brandy or whiskey! Do you think this would work with vodka or perhaps a red wine? I have used vodka in the past to make Tipsy Berry Sauce very successfully. I think it would work very well with vodka Imelda.I use Vodka in many of my fruit liqueurs and they are all delicious. I don’t think the alcohol content would be high enough in the wine though and I think it would end up as vinegar.